Sturgill Simpson is name that pressed itself on me a few times in the past years, but never made it to these pages. Simply because his previous record, Metamodern Sounds in Country Music (2014), did not convince me sufficiently. With A Sailor's Guide To Earth Simpson sets this step easily. The music is country(rock) oriented but with an infusion of southern rock, rhythm & blues and soul that makes this potent mix irresistible. Sturgill Simpson's voice is rough. As if a train filled with whiskey passes over it a few times a day. A train straight from the Jack Daniels distillery to the recording studio. The band does this voice right. The musicians wail and howl when called upon, they keep the rhythm up when appropriate. Some fine The Rolling Stones licks, 'Exile On Main Street' style, come by, as do 'Sweet Home Alabama' solos. A fine Hammond organ underscores the sound of this album to perfection. The old sailing ship on the cover may be coming out of the storm, the waves have far from abated. The storm in the studio has settled just fine. A Sailor's Guide To Earth is extremely well balanced. From some fine rockers Simpson moves with ease to a soul ballad that Otis Redding could have recorded if alive today. 'All Around you' is a fine example of country soul. Take the steel guitar away and there is Memphis soul for you. The combination lifts the album up and makes it so much more interesting, where a record with just one or the other would have been far less interesting to me. Come up with that sax solo! John Sturgill Simpson is a 37 year old singer from Kentucky. After a stint in the navy he formed his first band in 2004. After the band disbanded he packed up his bags and headed for Nashville where his solo career took off in 2013 with 'High Top Music'. Now three years into his career Simpson is better than ever. 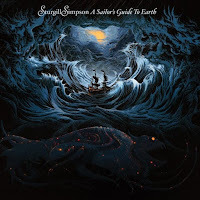 With A Sailor's Guide To Earth Sturgill Simpson breaks with the past. This is his own record, self produced as well as his major debut. The influences that drive him seem to be added to his sound, making him sound wilder than before. The Dap Kings come by, as well as a beautiful cover of Nirvana's 'In Bloom'. 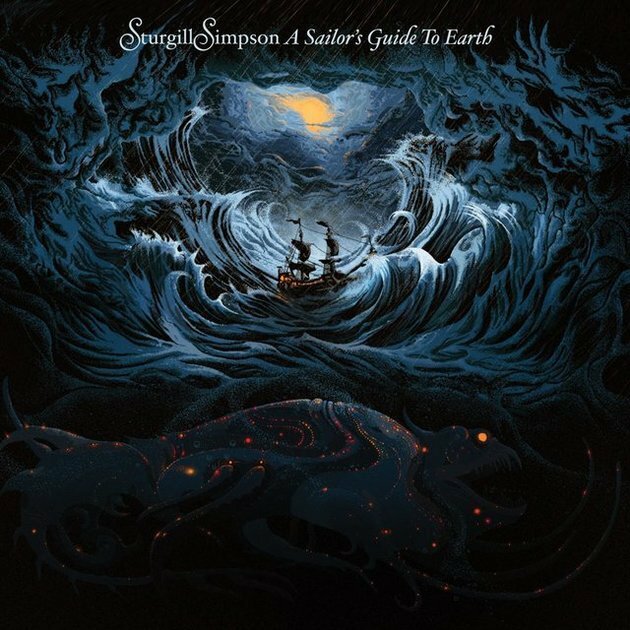 A cover in which Simpson makes the song really flower in a beautiful way. The tribute that he wanted to make truly came true. It all goes out with a giant bang. 'Call To Arms' goes all out. Fiery copper is spread out all over the place, making the song rock out fabulously. Simpson shows that he can handle all these genres and no doubt will make a live scene holler and shout. Here's some excitement for you people. The ideal song to end a gig with. His previous album may have intrigued me, but in the end not convince me. That doubt is gone. This is some record people.